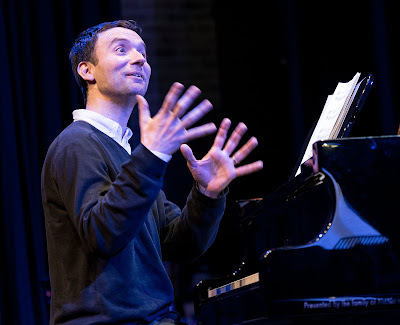 The first part of Jon Turney's Cheltenham Jazz Festival Round-up can be seen HERE, but there is so much music at the festival that nobody can cover all of it so this is just an addendum covering a couple of gigs that Jon couldn't get to. The Trondheim Jazz Exchange is a regular feature of the Festival. Three quartets are constructed by bringing together two students each, from Trondheim and Birmingham Conservatoires. They meet up at the beginning of the week to rehearse, do a local gig on Friday and appear on Saturday morning in the main festival programme at the Parabola Arts Centre. Later the bands head off to Norway for a return gig. Each year I'm amazed at the technical quality on show, and this year I was also particularly impressed with the full and mature tone of all three frontline horns. The bands aren't named – just given numbers. Band 1 consisted of Alex Liebeck bass and Robert Harper-Charles drums and Simen Bjørkhaug tenor sax, with some fine guitar work from Tore Hodneland. The style was clearly from the Coltrane era, and if there is a criticism of this year's bands it's that they did share a very similar style. In previous years I have been impressed with some unusual instrumentation and different approaches, but this year was fairly homogeneous. Band 2 comprised Nick Brown sax, James Owston bass and Vetle Larsen drums, with pianist Agata Ciurkot outstanding. They opened with a McCoy Tyner number and followed that with Ciurkot's composition which was by far the most interesting of the whole programme. Keep an eye out for her – I'm sure we'll be hearing more in the future. Band 3 was led by the trumpet and flugelhorn of Alex Stride, with good all round support from the band of Vegard Bjerkan piano, Noah Stone drums and Björn Petersson bass. The influences here were clearly Miles Davis and Chet Baker. The slightly uniform focus on that period may come from the schools rather than the musicians, or perhaps it's a constraint imposed by the format and the time available. Nevertheless these were twelve extremely competent musicians and three bands that would grace most jazz clubs – but by Cheltenham's standards quite conventional. My comments about the style are particularly apposite given the Parabola Arts Centre's final concert on Saturday night from the quartet of Hans Koller on piano with John O'Gallagher alto sax, Percy Pursglove bass, and Jeff Williams drums. This high class transatlantic quartet was also linked to the past with a tribute of sorts to Theolonious Monk. They didn't play Monk compositions but Koller's own which were described as reinventions. But here the musicians transcended the period with O'Gallagher in particular playing some blistering improvisations in a way that evoked much more modern influences.